water, cream, modified cornstarch, asiago cheese (cultured part-skim milk, salt, enzymes), romano cheese made from cow's milk (cultured part skimmed cow's milk, salt, enzymes), contains less than 2% of the following: butter (cream, salt), sugar, salt, enzyme modified egg yolks, whey protein concentrate, sodium phosphate, granular and asiago cheeses (cultured milk, salt, enzymes), romano cheese from cow's milk and cheddar cheese (cultured milk, salt, enzymes), parmesan cheese (cultured milk, salt, enzymes), xanthan gum, black pepper, natural flavors, enzymes, gum arabic. contains: milk, eggs. 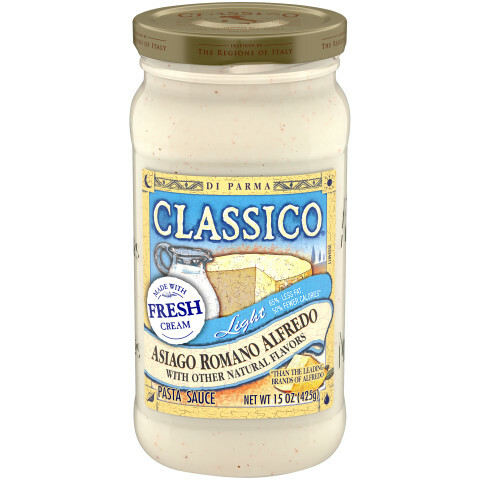 Classico® Light Asiago Romano Alfredo has 65% less fat and 55% fewer calories than the leading brands of Alfredo sauces, but all of the rich and creamy flavor. Made with real, high-quality ingredients like cream and Asiago, Romano and Parmesan cheeses, this better-for-you indulgence is sure to delight. I prefer this one over the regular light alfredo. I will never buy this product again. Creamy, but not tasty, leaves an aftertaste. 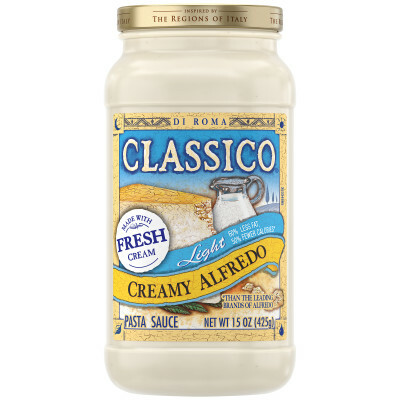 Just picked one up at Safeway.for a quick meal.this is the worst tasting Alfredo sauce, I have ever bought. Would not recommend.